While I have no real doubt they were the same man, unfortunately I can't find a record for the executed Herbert Francis Burden, I have been looking at this one for some time, specifically since he was chosen as the subject for the NMA. His story is quite strange, he deserted and disappeared from the East Surrey Regt around January 1915 and signed up using the same details in the Northumberland Fusiliers, a regt far enough away not to set alarm bells ringing I suppose. Whether he was a coward/deserter or just young and a pain in the a*se we will never know, although I bang on here about not making assumptions about motives and changing history, part of me wonders if he really knew the seriousness of his position because at any time he could have given his real age, we have to accept the army assumed he was of age. The man I am most concerned about being named on the NMA list is Ahmed MM (despite someone elses assumption those are his initials not an award). I have no other motive than interest in wondering why this man was chosen, he was not tried for cowardice or desertion, during a riot he beat an officer unconscious plus other issues which can be easily looked up. I am sure it isn't tokenism. Mahmoud Mohamed Ahmed has recently been accepted for commemoration by CWGC. He was "discovered" by a forum member and Ivor Lee happened to have his service papers which confirmed that the sentence was carried out. In From the Cold Project was able to make the submission on behalf of Ivor and the other member (apologies there - I've forgotten who it was and can't find the earlier thread). As I recall Ahmed's offence was mutiny. Presumably included in the "military offences" for which pardons were sought. Interesting about the discovery, in Shot at Dawn the authors state they had contact with CWGC and they weren't forthcoming with information, have they given a burial or memorial place? The selection by NMA is a bit odd, pardoning mutineers who incite and use violence. I'm not sure he was convicted specifically for mutiny. Checked my list I made in 2009 and I'd made a note about Pte Ahmed, it was to the effect that although his offence is listed as Mutiny in "Blindfold and Alone" and "Shot at Dawn", the latter makes the case that as he'd knocked the Officer unconscious, his offence could have been "Striking a Superior Officer". Oram's "Death Sentences passed by military courts of the British Army 1914-1924 list his offence as "VIOLENCE" not "MUTINY". Another man listed in "Shot at Dawn" and "Blindfold and Alone" as executed for "Violence" was Pte Samuel Sabongidda, 2nd Nigeria Regt, Executed 27/07/17 in East Africa. I noted in my list, the Official Figures do not include "Violence" as an offence which led to execution, however they do list the figure of "SIX" men executed for "Striking a Superior Officer" whereas "Shot at Dawn" and "Blindfold and Alone" state only "FOUR". I also noted the official figures were "THREE" executed for Mutiny whereas "Blindfold and Alone" listed "FOUR" including Pte Ahmed, neither include 7144396 Pte JJ Daly Connaught Rangers executed 02/11/20 for Mutiny in India, possibly because they and the Official figures did not count him as a "Great War Execution". From that I surmised Pte Ahmed and Pte Sabongidda were included in the figures for "Striking a Superior Officer" rather than Mutiny for the former and Violence for the latter, that would explain the anomaly's in the Official and the figures in the 2 books, this may explain why Pte Ahmed is on the "NMA list" (what is it?) is Pte Sabongidda on it? and are the 3 listed as executed for Mutiny during the Great War Pte Braithwaite, Gnr Lewis and A/Cpl Short included? NB I should add where I quote "Official Figures" these were given by "Blindfold and Alone". While I have no real doubt they were the same man, unfortunately I can't find a record for the executed Herbert Francis Burden, . Do you mean his service record or the record of the execution ? Now he's been accpted for commemoration, he'll be included on the new France (1914 -1918) Memorial, as & when it is built (names to go on that currently stand at 217 - most of them IFCP "finds"). Until then, his commemoration is only in CWGC's online database. and i trying to locate his last known address in Belfast. internet but without any success. If anyone can help it would be appreciated. Service record, have you found it? From the CWGC his age should be 20 years old in 1911. These are all the men around that age in the 1911 census of Ireland. The nearest candidate looks like George Hanna (19 yrs), 2 Locan Street, Falls. on a website and says "believed to be a Belfast man" and would like him included in my Belfast database i am building. I don't have McIlheney and he's not in Shot at Dawn, Blindfold and Alone or Death Sentences passed by military courts of the British Army 1914-1924, in the latter I can't find him even listed as sentenced to death and the sentence commuted, when and where was he executed? Do you have full name, number etc for him? Death Sentences passed by military courts of the British Army 1914-1924 lists only Clarke, Fox, Hamilton and Mullany as executed for Striking, Ahmed and Sabongidda are both listed as executed for Violence. Sentenced to Death age 25 with the 2nd Bn R Irish Fus 15/12/1916 for Desertion, commuted to 7 years Penal Servitude which was suspended. Then Sentenced to Death age 26 again for Desertion this time with the 1st Bn R Irish Fus on 19/10/1917, executed as you say 06/11/1917, his parents are listed as Henry and Elizabeth Hanna as they are on CWGC. Census in Armagh Father and Son, there ages, name's, tie in but they seem to be born Armagh. Grave Reference VII. D. 33. Son of Henry and Elizabeth Hanna. I don't see Benjamin or Henry, but parents are right so almost certainly the right family in 1901. Sam, yes that Hanna looks good, will be doing a lot more digging around, I will trawl though my newspaper files for Hanna. Private Hanna was charged and convicted of desertion on two prior occasions in early 1915 and late 1916 and sentenced to death – both were reduced to penal servitude. was in December 1914 and he had since heard from his sister in Belfast who was not well. He absented himself because he was upset at not being able to go and see “hispeople”. Private Hanna was found guilty and sentenced to death. The sentence wassubsequently confirmed and he was executed on November 6 1917, in Ytres. verify his claim. Nor is there evidence that the military hierarchy thought twice about taking a fourth son from the family by executing Private Hanna.
" Our first stop in Poperinge was a solemn one. In a small yard some short way from the road we gathered before a wall in front of which, shielded in a plastic sleeve, was a wooden post. It was to this post that soldiers condemned to be shot at dawn were tied. The wall still bears the pockmarks of bullets that missed their target, either intentionally or through surprisingly poor marksmanship considering how close the firing squad must have been to their target. It was here, during the course of the war, that sixteen British soldiers faced the firing squad for a variety of crimes. Nearby are the cells where the condemned men had passed their last hours, out of sight of the wall but not out of earshot. The walls of the cells bore photographs that reminded us that it was not only the British Army that made use of the death penalty. All the nations involved in the war (with the single exception of the Australian Army) had recourse to it. " I have a lot of "baggage",acquired through personal experience, over 60 years,of non-Military life,coupled with being Christian-named "after" the Brother,of my Father, "lost",through action, in WW1. You have clearly identified that my Father's Brother's Battalion(8th Royal Scots) had a "man" executed in 1917, and it remains clear, to me,that my Uncle,as he was killed in 1918, would have known of the fact and as a Sgt.,of the Battalion, may have even attended,directed,and even participated in the execution of one of "his own" through "Orders" and his desire to protect "His" Battalion's good name. So what, after 90 years, does a preserved WW1 execution post prove?Apart from the fact it is still there and signifies that " some WW1 broken British men" were executed by "their own" often unfairly, with the benefit of hindsight,descendant pressure,studious research,etc, in defence, of their Country's greater good. An earlier thread which suggests the "post" isn't genuine or, if it is, then it was only used for one execution. 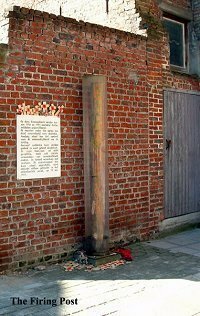 As I mentioned in the above quoted thread myself and Julian Sykes were the first British historians to ever see this post, when we carried it out of the Poperinghe Museum to photograph it in the mid-80s. The post we saw then was certainly genuine, contained bullet holes and blood stains. Is the wooden Post you reviewed, in your opinion, the same Post as that shown above ? It is reputed to be but I have no way of verifying that, all I know is that what I saw all those years ago was.